Sometimes, one can’t help wondering if the Law Minister K Shanmugam is eyeing the the Education Minister Dr Ng Eng Hen’s job. After all, the Ministry of Education is seen as a crucial stepping stone to senior ministerial position within the Cabinet, such as the positions of the Prime Minister and Deputy Prime Minister. In a recent PETIR editorial, K Shanmugam suggested to introduce comparative political system to the classroom, further blurring the line between state organ and party organ. Already the line is blurred in Singapore. For starters, the Government Parliamentary Committee (GPC) is a party organ that performs a function of a Select Committee. The GPC is not qualified by the Singapore Constitution and it was introduced 2 years after the then MP for Anson JB Jeyaretnam first mooted for a Select Committee to examine the decision and processes of each government ministry, in 1985, in order to balance the powers of legislative branch with that of the executive branch of the government. While the GPC performs the role described by JB Jeyaretnam, it forms a hurdle for the Opposition to become an alternative government as the Opposition cannot participate in GPCs. In the editorial, K Shanmugam emphasised the agenda of maintaining PAP’s hegomomy in Singapore. He wrote, “One could conclude as long as PAP stays true to its principles and deliver progress, it should remain the dominant political force. But the conclusion is not so clear cut.” He goes on to say, “One factor which may potentially weaken its [PAP’s] appeal is its ability to communicate its fundamental message to a younger electorate.” Are we in the danger that a state organ such as the Ministry of Education is morphing into a party organ? Another striking example of the diminishing distinction between state organ and party organ would be the setup of the HDB and People’s Association. A familiar complaint among opposition political parties is that the HDB does not consult the elected MP of the Opposition constituency on issues of estate management and HDB upgrading but the looser candidate from the ruling party who failed to win the ward. Meanwhile, the resources of the People’s Association are only available to the looser PAP candidate who acts as the grassroot advisor for the Opposition constituency to the People’s Association. The Singapore Armed Force is also playing to the ruling party’s tune. A friend told me during his recently concluded reservist training, he had to attend a National Education talk by a retired colonel. While dismissing the reservists’ complaints of rising ERP charges, the speaker emphasised the government’s line that Singapore need foreigners because Singaporeans refused to bear more children. The speaker also said if the Singapore government becomes corrupt as in the case of the Phillippines, Singaporeans would have to become domestic maids abroad. In the same editorial, K Shanmugam emphasised the wisdom of PAP. He wrote, “It [PAP] understands how vulnerable Singapore is in many respects – size, geographical situation, racial make-up, regional political, economic, military and social situations.” As if the collective wisdom of the PAP is invested in the Cabinet, but in fact leadership renewal within PAP appears at best, to be of form but not substance. While the leadership figures in the party have changed from one generation of cadres to another, party stelwart Lee Kuan Yew remains at the forefront as the ruling party’s human face and source of credibility. The current and previous Prime Ministers Lee Hsien Loong and Goh Chok Tong have failed to grow beyond his shadow. During the 2004 Singapore Airlines Saga involving labour dispute between the pilot union and management, it was the then Senior Minister Lee Kuan Yew who interfered in his ministerial capacity. There are 4 pillars in a typical discourse of politics and public policy – state, market, society and geography. While the PAP has emphasised Singapore’s small size for its more authoratarian approach, the highly urbanised nature of Singapore actually facilitates for democracy. High population density provides the environment for natural conversation while high literary rates and high internet penetration facilitates the flow and exchange of ideas. It is not so much that whether democracy delivers good governance but actually urbanisation has lowered the barrier to participation in the public discourse of politics and public policies. On the other hand, the rule of law is actually a manifestation of economic priority found often in trading sea ports and it is not a result of good governance. Geography can impose barriers to participation. For example, the more prosperous cities of China demonstrated democratic trend such as greater participation in civil society and more voices representing special interest groups in policy making while the rural areas of China are governed with a authoratarian slant as the rural population is not only poorer but also much more vulnerable to mother nature. Deference to authority is not due to choice but rather natural circumstances. In restropect, barrier to political participation in Singapore is artifically imposed and not imposed by geography. According to K Shanmugam, deviating from the Singapore model of democracy, which has delivered stability and rapid progress, will lead to trade-offs. He also said that Singaporeans are entitled to choose what trade-offs they want. However, Singaporeans have been administratively denied from choosing given the extensive walkover of GRCs in Singapore. Will the government put up the issue of political representation for public referendum? Calling Singapore model of governance a form of democracy is an act of milking the legitimacy of the word “democracy” Unsurprisingly, this has been done by national leaders of other countries. Examples include Surhato’s “Pancasila democracy” in Indonesia, Vladimir Putin’s “managed democracy” in Russia and Than Shwe’s “discipline-flourishing democracy” in Myanmar. One only needs to prefix democracy when there is deviation from the principles of democracy. 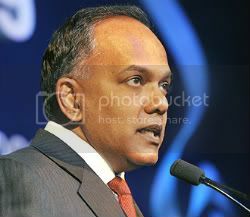 More interestingly, K Shanmugam has failed to substantiate the trade-off of the Singapore model of governance, including but not limited to, the lack of accountability of the spectacular losses of our sovereign wealth funds, the market failure of the Singapore’s real estate sector whereby a single player dominates 80% of the market and the lack of competition in domestic markets, leading to escalating costs for the consumer in areas such as public transport. Even the banking sector is exempted from anti-trust laws in Singapore. Last but not least, do we need political education to become politically aware? Is knowledge only attained through schooling? If the purpose is to gain political awareness to make informed choice over the type of government, then what is really needed is political participation in student governments to experience and understand the process and constraints. However, if there is no opportunity to make the choice in the first place, then political education in school is in fact political indoctrination. Extrapolating from current circumstances, the younger electorate will not have the opportunity to vote on this issue unless the government opens up the issue to a public referrendum. Prescribing an academic approach towards comparative political system is a distraction because politics is driven by aspiration and shaped by processes and constraints. More importantly, the point of having political education is to prepare students as future voters and not political scientists. Politics should not be simplified into abstract notions taught in the classroom, but rather political education should increase students’ awareness of political strategies and channels to communicate their thoughts related to policy-making and partisan politics. Worst of all, it will be the dearth of political ideologies should students are only trained to evaluate political thought according to this prescribed framework. In conclusion, there is no need for political education in the classroom. Instead, student governments should be liberalised to provide more opportunities for participation by the student population. Opportunities include, but not limit to, forming special feedback group within the student union to advocate or reform school policies, participating in union campaigns.